The Engel combi gives you the best of both worlds - fridge & freezer in one - no need to choose. 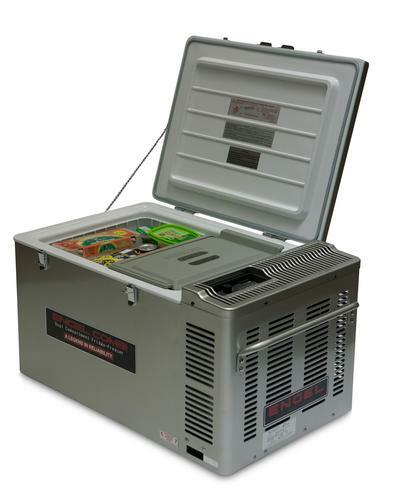 The first real portable fridge-freezer with the convenience of separate fridge and freezer compartments - ideal if you have lots of children or planning a long term trip around Australia. The thermostatically controlled fan provides cool air from the freezer section to maintain accurate refrigerator temperature. The freezer compartment has a digital temperature read-out for added convenience and this model now features the new user friendly digital controls with built in battery monitor. This battery monitor has 3 settings, High, Low and Off. The 'HIGH' setting is a cut off for a voltage of 11.5 volts DC. The 'LOW' setting cuts of at 10.5 volts DC. And the 'OFF' setting turns the battery monitor off so that the fridge can run straight from your Power Film Solar panels or when the output voltage from your vehicle is low. Powered by the renowned 'Swing Motor', this Engel Combi has all the efficiency and reliability ENGEL portable fridge-freezers are famous for. NOTE: This unit must be used as a fridge & freezer at all times it will not work effectively in any other way so be sure this is what you want before you purchase. Solid steel hinges & steel latches. Simple dial control & read out. Note: Add extra 45-50mm each end of external width for handles. Price: $1899.00 RRP Engel fridge only. $1725 with genuine Engel transit bag valued at $275 included Free of Charge. Phone or Email for your Special Price.